Tonight’s Bob’s Burgers has no business hanging together as well as it does. The episode begins with Mr. Frond press-ganging the Belcher children into appearing in his empathy music video. Instead, of say, exploring what the Belchers must do to live down this indignity and earn back the respect—well, probably not respect, but at least not constant mockery—of their peers, the episode instead wanders all the way to a story built around Will Forte’s returning Kurt, the town’s horniest pilot, reconciling with his estranged sister Laverne at an air show. The narrative distance between the opening and close really ought to be a damn chasm, with the Kurt story overwhelming the Frond-centric stuff and leaving the kids’ initial plotline irrelevant. Such a storytelling bait and switch isn’t all that uncommon—The Simpsons was mocking its own tendency to rely on such discarded opening setpieces about a decade before Bob’s Burgers even premiered. So extra credit to “Live And Let Fly” for figuring out how to tie all these wildly disparate elements together so seamlessly. A few clever storytelling choices here help make the episode coherent. The seemingly throwaway restaurant B plot introduces the air show. But even that would just give us the latest round of delightful Bob and Linda silliness if not for Louise’s plan to get exact vengeance on Mr. Frond for humiliating them. The scheme itself at first appears impossibly silly, with the kids’ stick figure imaginings emphasizing that it really should fall apart the moment they encounter a sensible adult. Good thing then the plan only brings them into contact first with Mr. Frond, who is only too happy to share how all other guidance counsellors are just the worst, and then Kurt, who is immediately ready to bring the kids into his potential murder plot. Maybe Bob and Linda could have stopped any of this, but as they reflect when they hear the kids over the loudspeakers at the air show, it’s not like they ever pay attention to anything. The result is that “Live And Let Fly” locates a lot of its emotional beats around Kurt and his estrangement from Laverne. That could be tricky if the episode were actually asking us to feel anything about Kurt, as he is such a ridiculous character, only sympathetic to the extent that it’s hard to hate someone so terminally pathetic. Again, he tries to get the kids to help maybe kill his sister within minutes of reuniting with them, though not before checking on whether Linda is still with Bob. Still, this is Bob’s Burgers, so the show isn’t going to be too mean-spirited, even toward the rare side character who might deserve it. Yes, he repeats all the same mistakes that did him in last time, right up to a breakfast of huevos rancheros, but at least he doesn’t poop in the cockpit again, instead just missing the ribbon he’s supposed to slice by a good 50 feet. And he does get to reconcile with Laverne, all while the air show announcer puts in a truly heroic effort to play this all off as a historically accurate World War I dogfight reenactment. If there’s any major weakness in the episode, it’s in how Tina solves Kurt and Laverne’s sibling crisis. The reveal that their dad both trained them independently to do the Dice ‘n’ Slice and then lied to each that the other had stolen the move is a confusing way to let both siblings emerge as good—or something close to it—in this scenario. The resolution relies on the actions of a character we’ve never met, and I’ll admit I missed the first time around why Tina found the siblings’ offhand comments about their dad training them so significant. This would be a bigger problem if we were actually meant to invest emotionally in these two, but they’re clearly just a ridiculous means to the actual end, which is the Belcher kids drawing on the lessons from Mr. Frond’s music videos and, in so doing, realizing that their guidance counsellor doesn’t deserve to have his life ruined. Kurt even gets his redemptive moment here, with Louise ordering him to use the Dice ‘n’ Slice to destroy the sign he had his unlicensed pilot friend fly for him. Okay, it’s not a totally redemptive moment for him, but close enough. All of which is to say the orbit for this episode is longer and more eccentric than most, but everything eventually comes full circle. Indeed, the episode’s conclusion is all the more satisfying because its elements had appeared so scattered up to that point. Plus, we get an all-time great subplot for Bob and Linda. 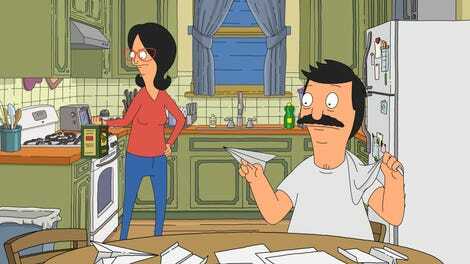 Count me among those who cringes every time the Belchers throw away money they obviously don’t have, but Bob’s total obsession with the art of airplane folding makes any discomfort worthwhile. Bob routinely loses his levelheaded practicality when he finds something new to obsess over—and really, that’s his entire restauranteur career summarized anyway—and it’s always a hoot when he cares about something enough to spend all his money in pursuit of perfection. He even happily puts up with Edith and Harold, for crying out loud. Linda’s own training doesn’t get as much attention, mostly because it’s just her lifting an olive oil can up and down until she tweaks something at the crucial moment. They really earn their ignoring of their children in this one, basically. “Live And Let Fly” is one of the sillier Bob’s Burgers entries, and it would likely all fall apart if the episode weren’t so damn committed to its most outlandish decisions. It isn’t just that Kurt is one of the more ridiculous characters the show could bring back. Trying to have a couple planes buzz each other to enact the pilots’ sibling squabbles is a damn hard thing to animate, and the air show announcer’s desperate attempts to play this all off as normal can only do so much if the visuals were any less believable than they are. There are little details here and there that the show might have handled a touch better. Tina’s homicidal rage toward Mr. Frond is hilarious but also just kind of dropped, and it might have made sense to clarify Laverne is Kurt’s sister a bit earlier, if only because I assume every woman in Kurt’s life is either a former flame or would-be former flame. But no matter: This is a tremendously funny episode, one that goes all over the damn place in pursuit of gags. It’s hard to argue with the results. The reveal that Kurt’s full name is Kurt Enerny is so wonderfully, exquisitely dumb. Kudos to everyone involved. All three named paper airplane designs—Dirty Rotten Scoundrel, Bowfinger, and What About Bob—are the titles of Frank Oz-directed movies. Assuming Barry B. Fallin’ is committed to that naming scheme, that raises the very real possibility there are only about nine other airplane designs in that whole big book Bob bought. That would be just too perfect, really. 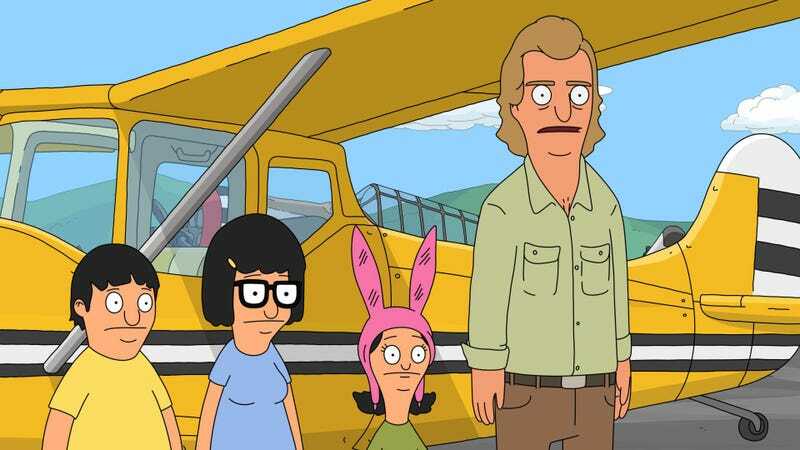 Teddy really did play himself by letting the Belchers in on his paper airplane plans. This is what he gets for being such a social gadfly, I guess. I threw some mild but admittedly unprovoked criticism The Simpsons’ way up top, though it’s worth acknowledging a classic “Simpsons already did it” moment: The Belchers’ poorly hidden video camera immediately made me think of Homer assuring Apu to pay no attention to his giant cowboy hat when going undercover to expose the Kwik-E-Mart. For the record, “Homer And Apu” aired nearly 25 years ago, the “Simpsons Already Did It” episode of South Park is itself 16 years old, and Bob’s Burgers is nearing its eighth anniversary. The passage of time in animation probably shouldn’t amaze me anymore, but it still totally does.